click here... Now available online "Daughter of the South,"
an original musical score written by Louise Thomas. Chapter members visit and take needed items to residents at a local nursing home. ​​Fulfilling the sacred duty of benevolence toward the survivors of War and the dependents who rely upon them. Present-Day: The Daughters' Benevolent work is well known nationwide. Members serve as volunteers to numerous civic organizations and charities including homeless shelters, homes for battered women and children, hospital associations and food banks all over the United States. Honoring the Memory of those who have served and those who have fallen in the service of the Confederate States of America. Present-Day: We hold Memorial Services to remember not only the men who served in the War Between the States but also the Veterans of All Wars. We are currently working on numerous memorials including Find a Grave virtual cemeteries for our ancestors, deceased chapter members, and those who served the CSA from Wakulla County or who are buried in Wakulla County. Mary Tucker Tillman Silver Trophy, District placing the most UDC markers on graves of members. Tie District One. Certificate of Merit, Largest number of Vietnam Conflict Crosses Awarded. 5-Way Tie. Mrs. Sue McCutcheon Perry Silver Award, First Place, Best Overall Use of War Between the States Music. Certificate of Merit, Second Place Best lndividual Chapter Program devoted entirely to Southern Music. Certificate of Merit, First Place Largest number of books read by Chapter members submitted in prescribed categories with titles and authors on a percentage basis. Present-Day: Annually the United Daughters of the Confederacy gather at State and National Conventions, where Friendships and Loyalties are renewed and strengthened. 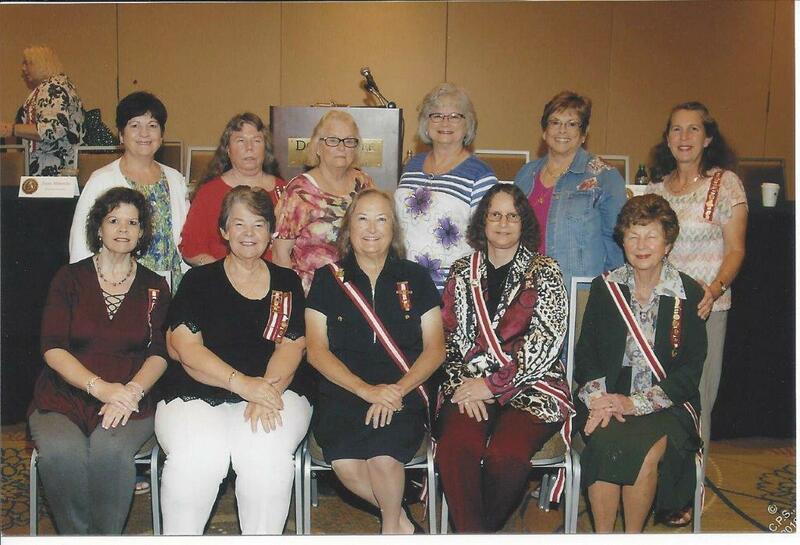 Pictured left are chapter members who attended the Division (state) Convention. For more information, contact us. To collect and preserve the material necessary for a truthful history of the War Between the States and to protect, preserve, and mark the places made historic by Confederate valor. Present-Day: All over the United States, local UDC chapters assist with maintaining, preserving and restoring Historic buildings, artifacts, monuments and cemeteries which are significant to the War period. We continue to collect and preserve for Historical posterity rare books, documents, diaries, letters, personal records, and other papers of historical importance relating to the period 1861 to 1865. The Goodlett Memorial Library located at the UDC Memorial Building in Richmond, VA is the repository for this collection. We acknowledge Historical Work by awarding two special medals. The Jefferson Davis Gold Historical Medal is awarded for outstanding contributions in furthering the study and preservation of Confederate history through historical research, writing, public speaking and other points of special achievement in keeping with the historical aims and purposes of the Organization. The Jefferson Davis Silver Medal is bestowed upon students who excel in the preservation of Confederate history. To record the part played during the War by Southern women, including their patient endurance of hardship their Patriotic devotion during the struggle and their untiring efforts during the post-War reconstruction of the South.